We had our peak weekend for fall color a few days ago, and I couldn’t be more excited! It’s my favorite season for SO many reasons. Getting to celebrate with Donald and Lauren made the weekend so much fun and the Olmsted proved to be a gorgeous venue this time of year. Being a witness to people making vows to each other is one of the most humbling and heart felt parts of our jobs… but vows like these two were even that much more special. Donald was raised in Jeffersonville, Indiana, right across the river from where Lauren grew up in Louisville, Kentucky. Even though they grew up so close together, it took years after serving in the Air Force and college transfers to bring them both back to Louisville. Even living in the same dorm didn’t cross their paths! A few years after undergrad, Lauren was working on her M.A.T. while teaching at a middle school and coaching volleyball, while Donald was across the river working as an Assistant Dean and Head football coach for an Indiana charter school. They randomly, finally, met on match.com and have been inseparable since. A year later they were engaged!! Weddings always give us a sneak peek into the lives of our clients. To interact with the family and friends, is to get to know them better. I have to say, this day was filled with genuine hearts and so much laughter. Lauren was laid back and relaxed all day while Donald was as tried and true as ever. Enjoy a few of our favorite images from their celebration at the Olmsted! To Donal and Lauren, thank you for choosing us to celebrate with you!! We’re praying for a lifetime of choosing joy and choosing each other. We love you guys! The girls started their day with brunch at the Audubon Country Club. It proved to be a gorgeous little spot and the perfect start to a beautiful day. After getting ready in the morning, we all traveled to the Omlsted for Donald and Lauren’s first look! This part of the day is always SO special!! Now that we’re in daylight savings time, we loose an hour of sunlight in the evenings. For all of you planning a fall wedding with later ceremony times, please be aware of this! We only had 20 minutes of light after the ceremony and would have never been able to get all of these gorgeous portraits if we had waited. I’m so glad they chose to spend their day together instead of in hiding, and I’m even more excited they chose to share personal vows with each other during this sweet time. They were so heartfelt and sincere. It was my favorite part of the day! What a fabulous day we had!! Thank you to the amazing vendor team that knocked it out of the park. You guys are the real deal! I am such a sucker for a fall wedding, and those fall colors at the Olmsted couldn’t have been more perfect! 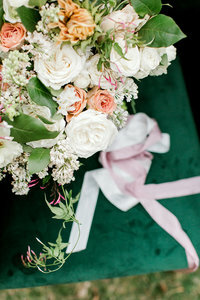 I love the way that they complimented the bridesmaids dresses and the beautiful florals! What a gorgeous Louisville wedding and your photography is stunning! I am in love with all of those gorgeous fall colors at The Olmsted and in the bridesmaid dresses, florals, and decor! You captured their wedding so beautifully! Their first look was so sweet, and I love that they had their pups in a few wedding photos! They sure picked the best Louisville wedding photographer! Aww you captured all those details beautifully! The Olmsted is so elegant and perfect to get that outdoor feel for portraits but indoor option for everything else. What a stunning day! The Olmsted is such a gorgeous venue in Louisville!! I love all of the beautiful details of this wedding, you captured them perfectly!! Oh my goodness what a lovely fall wedding at the Olmsted. I love the detail shots and her RINGS – just perfect. This was such a beautiful and classy Louisville, Kentucky event. Such a beautiful Olmsted Fall wedding and you captured it perfectly! Love the photo of the bride twirling her dress with the fall trees in the background!